On July 28, 2017, the waxing crescent moon will sit just a few degrees above Jupiter, passing the planet for the second time this month. If the weather is clear in your area tonight (July 28), check out the west-southwest sky around mid-twilight, about an hour after sunset. Jupiter is currently the brightest star-like object in the evening and among the first to come out each night at dusk. But for the rest of July and on into August, Jupiter will slowly slip farther down into the glow of evening twilight in the west-southwest. And by the first week of September, the gas giant will be setting right around the time evening twilight ends. This month, Jupiter is falling far behind Earth in the never-ending planetary race around the sun, and the giant planet continues to move slowly eastward among the stars. Currently, Jupiter can be found in the zodiacal constellation of Virgo. Because it takes nearly 12 years to orbit the sun, Jupiter spends about a year in each of the 12 zodiacal constellations. Jupiter moved into Leo in early August of 2016 and will exit Virgo and move into Libra in mid-November. As you admire Jupiter and the moon tonight, take note of the bluish first-magnitude star Spica, which is located about 8 degrees to the right of Jupiter. By Aug. 11, Spica and Jupiter will be separated by 6 degrees. 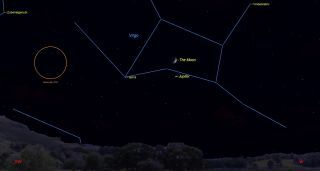 And by Aug. 25, when the moon will again be in the general vicinity, the apparent distance between the star and planet will have shrunk to just 4 degrees, or one-half the distance compared to right now. Jupiter and Spica will be closest to each other on Sept. 11, when they'll be separated by just 3.1 degrees. But by that time, Jupiter will be setting just over an hour after the sun, and Spica will likely be visible with binoculars against the bright twilight sky.